Our adventure with Icelandic sheep started in 2006. My interest in fiber arts led us in a search for fiber sheep. We were looking for a breed that would give us wool and lamb for our small farm nestled in the valley of the Big Blue River. We found a breeder with several breeds of sheep and it was suggested that we purchase sheep of several different breeds to provide different fiber and wool needs. We looked at Romneys, Merinos, and CVMs. This shepherd had several Icelandic sheep in his flock, and we were completely enthalled with the rugged beauty of these sheep and the beautiful long locks of natural colored fleeces. Needless to say, we drove home that day with an Icelandic ram and two ewes, the start of our Blue River Icelandic Sheep flock. We still have descendents of those original sheep in our flock today, along with sheep from other breeders. We are excited to have first generation imported AI stock to continue to build the depth of quality in our sheep. I am a member of Icelandic Sheep Breeders of North America and our sheep are registered with the Canadian Livestock Registry. 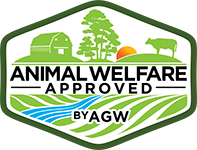 In 2017, we were excited to become an Animal Welfare Approved farm through a Greener World, and are the first certified wool producer to be animal welfare approved in Nebraska. As fiber artists, we continue to breed for fiber and wool quality. We work with our wool and know what qualities are desired and continually breed and manage our animals for a high end product. We also breed for high milk production for those who are interested in artisan cheeses and also growthy lambs from milky bloodlines. Icelandic lamb is acclaimed to be the best tasting, lean, mild, lamb available. We have butcher lambs available in season and have USDA inspected lamb available for purchase. Thank you for your interest in our beautiful sheep! We would love to assist you with selection of breeding stock or any of our unique products.